For the second time in the last few years, we find ourselves in a position to compare our TopPlace™ products with a very similar product released by Google (here’s our previous post about maps). Screenshot from the announcement on Google’s products blog. 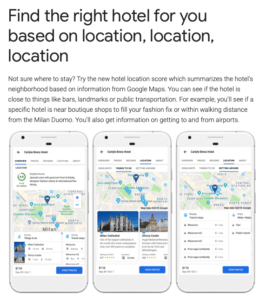 The rollout is certainly not surprising, as Google is trying the become a dominant force in the online hospitality space and location is one of the most important criteria travelers consider when choosing accommodation. Click to expand the image. 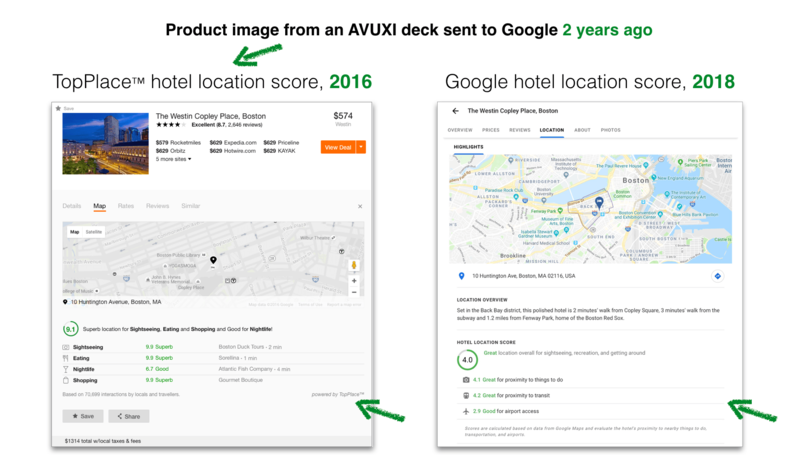 Screenshot from AVUXI’s deck in 2016 (left) and Google’s hotel location score in October 2018. 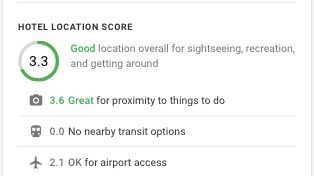 A curious detail is the airport accessibility criteria which, unless targeting those extremely short “in-and-out” business trips, we believe is less useful than more insightful scores of the surroundings of a hotel. 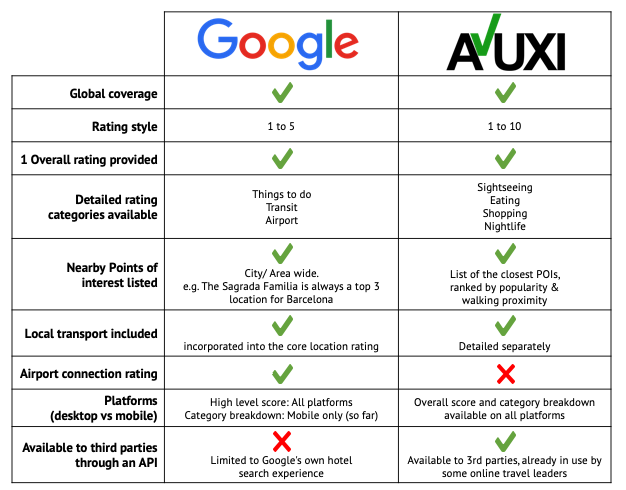 Perhaps that is partially the reason why we noticed some unexpected results on Google across different locations worldwide, with hotels located in very different city areas having the same scores. 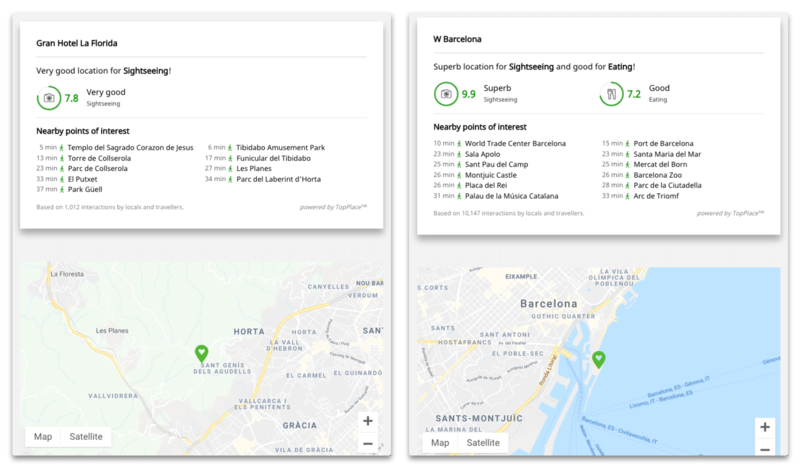 The example below shows a hotel up in the hills outside the main city area of Barcelona, having the same location scores as a hotel near the beach, not far from some very active “city hot spots”. Click to expand the image. 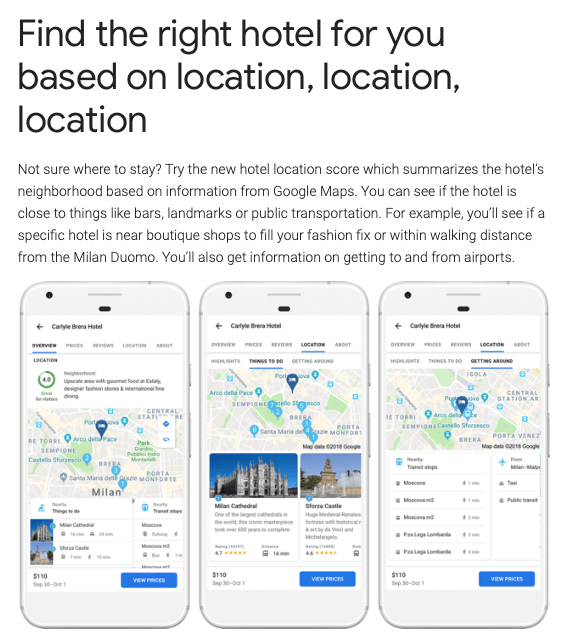 2 different hotels, 1 far from the city center and 1 close, having the same Google hotel location score. TopPlace™ Location Scores are generated by using 4 criteria: proximity to popular places for eating, shopping, nightlife, sightseeing and separately, nearby public transport. We calculate “proximity” as a convenient, reasonable walking distance from the hotel. We show a detailed categorization of traveler’s main activity categories, because a great area for nightlife is not necessarily good for sightseeing, shopping or eating out. Click to expand the image. 2 different hotels, 1 far from the city center and 1 close, having different location scores, as expected. Since our location scores are based on a walking distance proximity from the hotel, we offer the nearby public transport info as a separate feature. We believe there’s no right or wrong methodology. Showing location scores and insights to users is much better than not showing any location profiling at all. In times of overwhelming amounts of disparate data, we are glad that location scores are finally becoming an industry standard. The main question is which methodology provides the most meaningful results to travelers. We’ll be glad to hear your comments. Please feel free to reach out to us.